A beautiful, spacious, family home in a lovely mountain village, near to Lake Garda and Lake Iseo. La Favola is a spacious detached villa with private gardens, beautiful balconies, stunning scenery and is the ideal place to switch off and relax. Comfortably sleeping 8 people; there are four smart double or twin bedrooms over two floors, each with its own en-suite bathroom. The stylish upper floor has wonderful charm with a pretty kitchen, large dining hall, comfortable living room and two bedrooms. The lower floor has an entrance hall and further two well-appointed bedrooms with private bathrooms. Two large balconies offer all day sunny aspects and panoramic mountain views. Ideally positioned on a quiet lane shared by friendly neighbours, the villa receives full sun from dawn until dusk and therefore its balconies and gardens are wonderful places to relax and dine with a BBQ and drinks. The lower balcony has a large outdoor table and seating for 8 people. In the evening La Favola becomes truly enchanting with beautiful mountain silhouettes, crickets chirping and amazing night time skies. Both romantic and welcoming, La Favola makes a great stay for all, including couples, families or groups of friends who want to discover the region by day and relax in the evenings. The house is comfortably furnished and well equipped with plenty of space, making it homely and relaxing. Due to its location it makes a great base from which to visit many renowned places, without being in a busy tourist resort. Walking and cycling are popular with many breathtaking scenic routes, some on the doorstep and others at higher altitude such as Monte Guglielmo and Pezzeda. Other memorable days out can be found close by at Lake Iseo, Lake Garda and Lake Idro, with boat trips, waterparks, theme parks or watersports for families to choose from. Wine Tours and Golf are nearby in Franciacorta, Slightly further away you can visit Verona, famous for its Arena and open air Opera. The great thing about La Favola is its situation, whichever direction you take you will find a Mountain, Vineyard or a Lake! Jo moved to Italy in 2004 after visiting the region for holidays. She took time out after falling in love with Marmentino and its wonderful way of life, it’s scenery, climate, people and of course it’s great food! La Favola became home for ten years during which time she started a business with local Italian companies and embarked on a journey which eventually brought her back to England. Having made many friends in the village, and still loving La Favola, she decided not to sell the villa and keep it as her second home from home, and one that in 2018, she and her husband are delighted to let others discover and experience too. La Favola offers all year round relaxation, enjoying the change of seasons at all times of year. A delightful villa, immersed in greenery and one to be visited throughout the year. Great for couples, friends or family taking a few days break, or an extended holiday of up to thirty days. The Alpine Style architecture makes the large villa characterful and cosy . The location escapes the extreme humidity that often makes it too hot to sleep at night, yet basks in heat and sunshine during summer days; the air is warm and fresh, not stifling and arid. The villa’s aspects are wonderful and the sun rises and sets on both balconies making most days of the year, including Winter, sunny and uplifting with the skies and mountains shining in the sunlight. The climate is lovely all year round and the air is clean. All of the seasons can be enjoyed: Spring with beautiful alpine flowers, Summer with lazy days and local festivals, Autumn with a stunning display of colour, and Winter with snowy days and skiing close by. Both romantic and welcoming, La Favola makes a great stay for all, including couples, families or groups of friends who want to discover the region by day and relax in the evenings. Ideally positioned on a quiet lane shared by friendly neighbours, the villa receives full sun from dawn until dusk and therefore its balconies and gardens are wonderful places to relax and dine with barbeque and drinks. In the evening La Favola becomes truly enchanting with beautiful mountain silhouettes, crickets chirping and amazing night time skies. The house is comfortably furnished and well equipped with plenty of space, making it homely and relaxing. Due to its location it makes a great base from which to visit many renowned places, without being in a busy tourist resort. Walking and cycling are popular with many breathtaking scenic routes, some on the doorstep and others at higher altitude such as Monte Guglielmo and Pezzeda. Other memorable days out can be found at Lake Iseo, Lake Garda and Lake Idro, with wine tours and golf at nearby Franciacorta. toilet, shower, bidet, The shower enclosure is a large wet room. Yes, bedding is provided for each bedroom. A new 8kg washing machine is located in the laundry room. Ample private parking on the premises. Yes, towels are provided for each bathroom. The villa has two pellet stoves, one on each floor . Spectacular balcony directly accessed from living room door. We have two fresh coffee makers plus tea/coffee making facilities on both floors to enable guests to also relax on both balconies. Welcome pack awaits on arrival, including coffee, tea & sugar. Smart, well equiped, open plan fitted kitchen. Steps down into dining hall. There are three dining tables at the villa, one in the dining hall which seats 8, one on the upstairs balcony seats 6 and an outdoor dining table seating up to 10. The TV is situated in the living room and has a soundbar for enhanced sound. There is a DVD player installed in the living room. A good selection of childrens toys can be found in the living room cupboard. The garden is fully encosed and offers outdoor dining under its veranda. Comfortable longers are supplied to enjoy relaxing on the panoramic balcony. Spectacular views from the veranda. Large area with family dining table, seating up to 10 people. Bella casa, spaziosa, pulita e immersa nel verde. Splendido il grande terrazzo al primo piano da cui si gode di una vista bellissima . Casa fantastica, spaziosa e molto accogliente. La casa è fornita di tutto l'occorrente per trascorrere una piacevole vacanza ... La proprietaria molto gentile e disponibile. Wir waren 5 Tage in Marmentino und das Haus ist wirklich sehr gemütlich! Jedes Schlafzimmer hat sein eigenes Bad, doe Matratzen sind alle gut und das Haus ist mit allem (und mehr) ausgestattet, was man braucht! Ein kleiner Spielplatz u ein Mini Laden sind in laufnähe, für alles andere benötigt man allerdings ein Auto. Dafür kann man uneingeschränkt die herrliche Ruhe der Berge genießen! Thank you Jo for making these vacation a great one! Un chalet Suisse en Italie ! Très beau séjour. Chalet agréable et très fonctionnel. On peut aussi profiter des terrasses et de la vue ! Au centre de tout, il ne faut pas avoir peur de prendre sa voiture et les petites routes qui tournent et qui montent ! Le séjour est un bon mélange d’activités dans la nature et de visites culturelles ( Brescia, Vérone, Venise, ....). Location à conseiller ! Wir sind sehr zufrieden bis auf ein paar Kleinigkeiten. sie alt und das Spülbecken unhygienisch. 2. auf der unteren Etage ist es Klamm feucht es ist unangenehm ins Bett zu gehen. Aber sons alles Super auch die Nachbarn sind sehr nett. Würde es Jedem empfehlen eine Heröiche Aussicht. La Favola is situated in a tranquil, mountain village with stunning scenery and a place where you can switch off from the fast pace of life. Being within close driving distance to both Lake Garda and Lake Iseo, this enchanting villa is an ideal place to discover both the Italian Lakes and Mountains during your stay. Nestled in the Brescian Alps, 900m above sea level and being a National Park, you will find numerous scenic walks and cycle routes, pony trekking, beautiful village churches with renowned works of art; all unspoilt by tourism. The local produce includes fantastic local cheese made to a 500 year old tradition, locally produced honey, meats and fruit. Upon request, freshly baked patisseries delivered each morning to your door. Plus; there are some fantastic local wines. Within walking distance you will find two shops, post office, pharmacy, doctor’s surgery, children’s play area, garage and two bars. Neighbouring villages of Irma and Vaghezza with pretty streams and barbeque areas, and the River Mella can be reached on foot. Within a short scenic drive you’ll find tiny Lake Bonji to fish and Pertica Alta with its restaurants. There’s also Ranch Vaghezza, with pony trekking and an atmospheric restaurant. Guided walks, for all abilities, may be able to be booked in advance, taking you through spectacular scenery with lunch at traditional mountain restaurants, please contact the owner for more details. 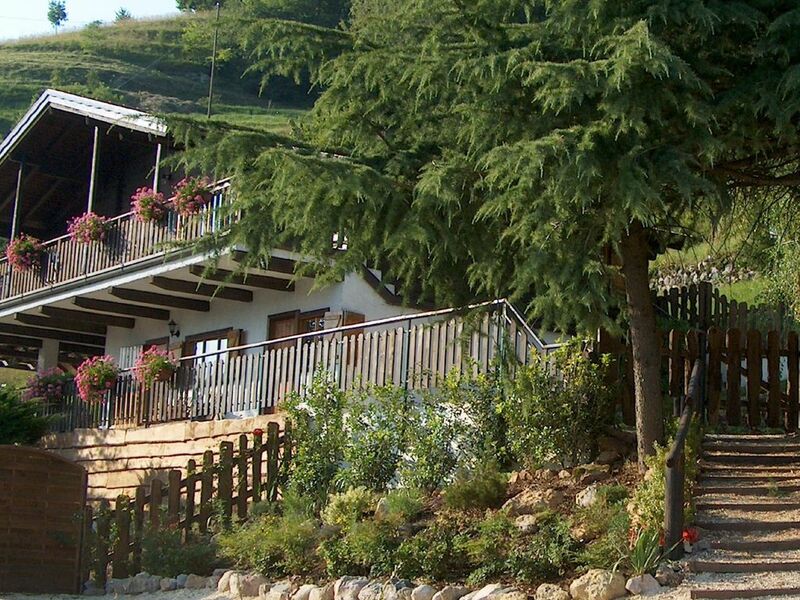 La Favola makes an ideal stay for both short & long term breaks giving you an ideal opportunity to discover the Italian Lake and Mountain region and way of life.